From Europe to Australia, we move on to our next set of results. Returning for a second year in a row, the results of the INFE Poll 2018 are set to be unveiled here at ESCToday in collaboration with the INFE Network, with votes to be gathered and combined together from all of the participating INFE clubs. Flying over to the other side of the planet for our next group of results. ESCToday will exclusively be bringing you the results of the INFE Poll 2018 over the month to come in collaboration with the INFE Network. INFE Australia is the next club to vote in the INFE Poll 2018, but who has been awarded the next set of 12 points? And 12 points go to… Poland! INFE Australia presents some interesting results; whilst FYR Macedonia receives their first set of votes, Poland also receives their first points, that of which being the top 12 points. As well as this, it is the first time in the INFE Poll, other than when INFE Israel presented their votes, that the current leader of the poll (Israel) failed to receive any points. INFE Australia is a new member of the INFE Network (2017). Following three successful years in the Eurovision Song Contest, it was only matter of time before the formation of a core group of fans entering as a club to the network, in a country where the popularity of the contest is very high. 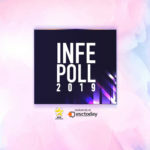 INFE Poll 2019: The points from Australia are in ! Australia 2018: Jessica Mauboy’s first rehearsal.